So Mean They Would Eat a Fisherman If They Could! The motto of the largemouth bass is "If it moves, eat it!" That's the largemouth bass motto. A bass will eat anything it can swallow and it can swallow a lot due to its large "bucketmouth" and flexible stomach. It's a "generalist" thug that, by experience, grows "smarter" with age and adapts to environmental changes to survive. As one of the most voracious, aggressive predators in lakes and rivers, though primarily a lake fish, this "big mouth bass" has become arguably the most popular freshwater game fish in America today. They're such aggressive feeders that if one ever grew big enough it would probably eat you! The appeal of fishing for ole bucketmouth lies in learning some fishing facts about them. Knowing about preferred bass habitat, the aspects of bass spawn and the way and on what they feed. Such knowledge prepares you for the hunt and hopefully enables you to find, possibly catch and then release this brute of our freshwater rivers and lakes. Finding one is challenge enough, enticing one to "take" your artificial lure is something else altogether. Coloration varies from dark green to pale green or olive. Their bellies are white to yellowish. The back and sides are usually very dark with a black lateral band incorporating diamond shapes running from head to tail. This band is dark if the bass is in shallow water and exposed to sunlight. If it has been in deep water for a while it will be lighter in color. The dorsal fin is two part with the front section being very spiny and the back part larger but soft. 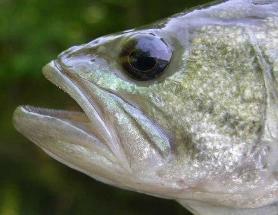 The mouth of a largemouth bass is LARGE, thus the nickname "bucketmouth"! Some simply call it the "big mouth bass. Its tip or flap extends past the rear edge of the eye, unlike that of the smallmouth, which never goes beyond this point. It's this mouth that enables the largemouth bass to engulf prey, or try to engulf prey, as large as itself. 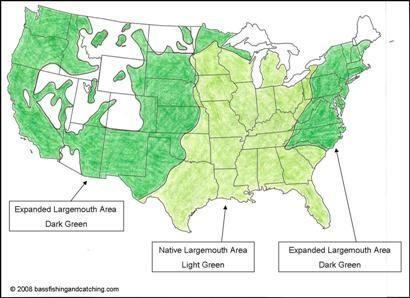 Where Do You Find Largemouth Bass? Finding bass isn't that difficult. It's the catching part that trips you up. Distribution today spans all lower forty-eight states and Hawaii, though its native range was much smaller. Deliberate and accidental stocking between the years of 1870 and 1894 placed them in new waters to which the largemouth readily acclimated and now thrive. Largemouth bass habitat is very diverse. They can thrive, or at least survive, in almost any warm water environment, be it shallow weed choked natural lakes or very deep, rocky reservoirs with very little weedy growth. They are also at home in large rivers, slow moving streams and innumerable ponds across the U.S. They prefer water temperatures from 68° to 78°F and spend much of their time in water no more than twenty(20) feet deep. In lakes and major rivers they gravitate to areas of submerged vegetation, flooded timber and brush. Dissolved oxygen levels in water bodies are very important for largemouth bass, more so than any other game fish and this tends to make them primarily a shallow water fish. Water temperature is also important and influences their daily and seasonal movement and where they might be found. Spawning activities begin when water temperatures reach 63° to 68°F. The male moves into shallow bays and flats and sweeps away debris from a circular area on a hard bottom. The female moves in, drops her eggs, 2000-7000 per pound of body weight, upon which the male deposits his milt. The male remains to guard the nest, the female heads for deeper water to recover. Their spawning habits are something about which we bass fishermen better have an understanding. Factors that relate to their reproduction have lifelong impacts on the instinctual and habitual daily activities of bass and our ability to locate them. If you can't locate them you sure can't catch them! The largemouth diet consists "primarily" of other fish. They are extreme opportunistic feeders, however, and will eat just about anything they can get in their mouth. They tend to be experimental feeders because of this but do learn (become conditioned) from repeated experiences with prey what is good, what is not and what takes to much energy to catch for the amount of nutritional reward. They'll also eat ducklings, frogs, snakes, crawfish, lizards, rats, mice, waterdogs and insects. Though extremely aggressive the largemouth bass (Micropterus Salmoides to all you budding biologists out there, bucketmouth to the rest of us) is also very cautious and always wary of danger. They spend a surprisingly small part of each day actually feeding with much of this taking place in early morning and late afternoon. A largemouth's growth depends on the length of the growing season and the number of days the water temperature is above 50 degrees. "Roughly" this is about five months in the northern part of the U.S and ten months in the southern sates. They grow faster and bigger in the South but live shorter lives (ten years in the South) than those in the North (up to 15 years). Here in Tennessee, where I and my bass bum™ buddies primarily fish, a largemouth (northern strain) can reach 10" in two growing seasons, 17" in three and 18" in four. For you guys up North, that would more likely be 4", 6" and 8" for the same time period. Of course, availability and type of food sources has significant impact on growth as well. Find quality largemouth bass habitat, you'll find old "bucketmouth"!